InterAksyon-News5 file photos of Vice President Leni Robredo and former senator Ferdinand Marcos Jr.
MANILA, Philippines — The camp of Vice President Leni Robredo took up former senator Ferdinand “Bongbong” Marcos Jr.’s offer to withdraw his pending motions before the Presidential Electoral Tribunal (PET) if his rival would also do the same. “We accept the challenge of Mr. Marcos and his lawyer to sign a joint motion to withdraw any and all pending motions and incidents at the Presidential Electoral Tribunal which may cause the delay of the recount of ballots from the pilot provinces of Camarines Sur, Iloilo and Negros Oriental,” Robredo’s lead counsel, Romulo Macalintal, said in a statement issued Tuesday. 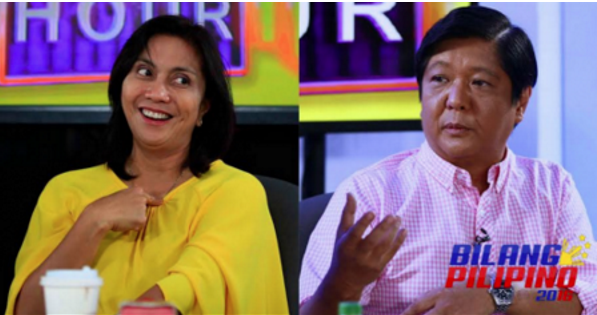 Robredo’s camp offered to sign joint motion with Marcos Wednesday morning. “I am inviting Mr. Marcos and his lawyer tomorrow at 9.00 AM to sign a joint motion,” said Macalintal. “This is to confirm that we are not causing the delay in the recount of ballots. It is Mr. Marcos’ raising of baseless allegations and irrelevant issues that is causing the delay in the recount,” he added. On June 29, 2016, Marcos filed an election case against Robredo before the Supreme Court, sitting as the PET. He alleged that his closest poll rival won the vice presidential race because of cheating.